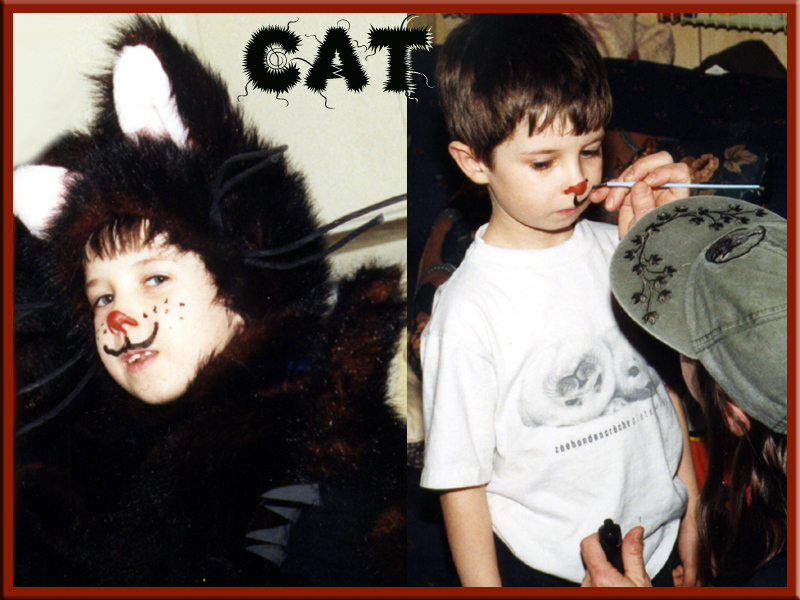 Growing up with cat siblings, it was only natural that my son would want to be a cat one year. The cat costume made of thick fake fur was a particularly good choice for 1999’s bitterly cold Hallowe’en. I left the face open and attached black raffia whiskers to the sides of the face. Large black craft foam claws were sewn to the costume’s front paws. My son decided he wanted to be a pirate in the first grade. For the hat, I transformed my wide-brimmed dressy felt hat into a traditional pirate hat, trimming the edges with gold ribbon to make the outline stand out. I used a sheet of white craft foam to cut out a skull and cross-bones. The piratical striped shirt and bandana was part of his ordinary wardrobe already. 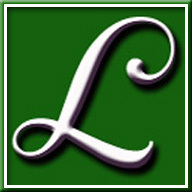 The cape is trimmed with the same gold ribbon, and held together with a chain clasp. I also made a shoulder “swag bag” to hold all the accoutrements, The two main weapons were a plastic cutlass, and a reproduction antique pistol (a non-functioning lighter). 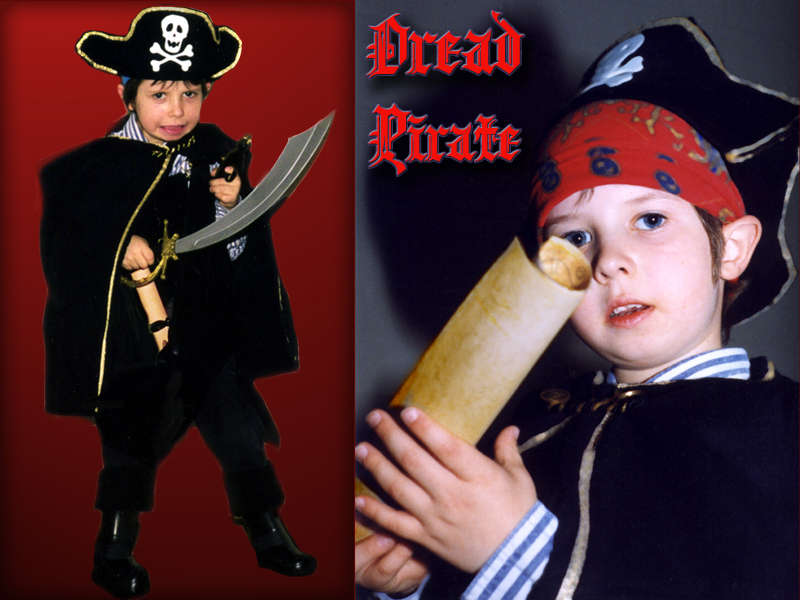 We had a lot of fun making all the pirate accoutrements for this one. The spyglass was made from two different sized thick cardboard towel rolls that could nest together with a clear Pringles lid attached as the “lens” Then I made a piratical treasure map, which was painted it with lemon juice and baked in the oven so it would acquire the patina of antiquity. There was also a pirate flag made with leftover black fabric hung on a bit of bamboo. I made white foam skulls in appropriate sides to adorn the back of the cape, the flag, and the spyglass. 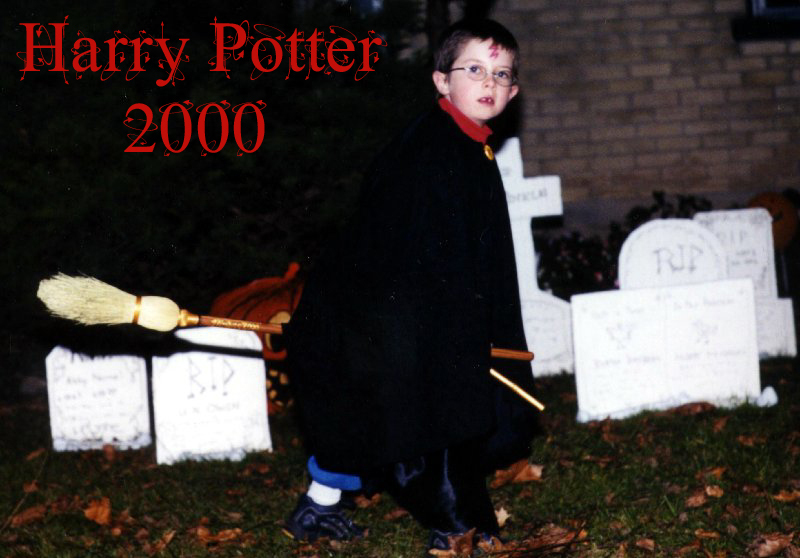 My son wanted to be Harry Potter before the first movie was made. So research for this costume required my return to the source material of the books. We needed a wand. Since a visit to Ollivanders Wand Shop was out of the question, a nice hollow piece of Bamboo — painted gold — was just the ticket. Next insert a nice Phoenix feather (either a found bird feather, or one purchased from a craft supplier) and tamped down with an appropriately sized glowstick. The glowsticks I used were intended as earings, so there were two to a package, found at the Dollar Store. One of these glowsticks will last out the night, but it is always handy to have backups, particularly as such inexpensive glowsticks have a higher incidence of not activating). The key element of clothing for Hogwarts students was a nice back wizarding robe to be worn over ordinary street clothes. To make the costume more Harry Potter specific, I decided to make a Hogwarts crest for young Harry’s book bag. There was a beautiful black and white line art rendering of the Hogwarts crest in the books. Since this drawing was uncredited, I assumed it to be the work of author J.K.Rowling (which seems now to be the consensus on the Internet). The books told me which colours were required for each of the Hogwarts houses. I transformed a small straw broom into a Nimbus 2000 by removing the stitching to make it flat, then binding the straw in a circle. I stained the handle and painted “Nimbus 2000” on the shaft, then varnished it. He loved the costume, but his biggest disappointment when Trick or Treating was that most people had no idea who Harry Potter was. 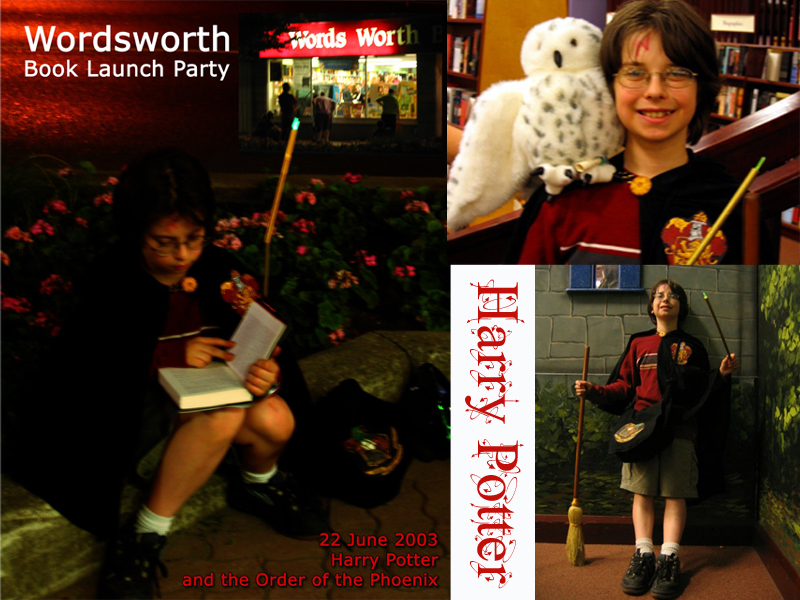 This costume was reused again later, when he attended a Harry Potter book launch with the addition of a Griffindor crest to the wizarding robe, which was somewhat shorter now, as he’d grown in the intervening years. 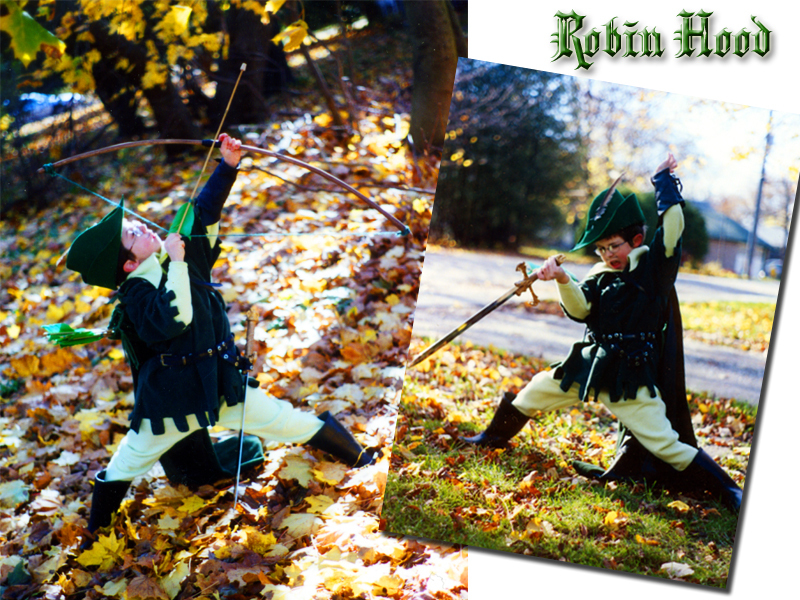 For my own amusement, my son’s Robin Hood costume *had* to be based on the Errol Flynn costume from the Warner Brother’s classic. My research for this one involved searching through the film and making sketches of all the necessary bits. I chose to diverge from the movie, following convention (and the movie poster) in making my son’s hat green, rather than brown. We used a fairly spectacular found feather for the cap. The crenelated tunic was a little bit finicky but not so difficult to sew. I am not the world’s best seamstress, and I try to make costumes durable, I use fabric that doesn’t fray and unravel easily, and it is always a bonus if the stitching can disappear into it. I put gromets into the v neck of the collar to thread leather lace through, but the gromets never gripped the soft yielding fabric, and started pulling out from the start. After I had to remove them, the laces stayed in the holes just fine on their own. Both Historically and cinematically, Robin Hood’s weapon of choice was the long bow, so that was an important bit. Since a long bow is almost as tall as it’s user, I pruned an appropriately long and skinny branch from the hedge, and used green twine for the bow-string. I wound a scrap of black leather around the centre of the bow to make a grip. I also sewed him a leather scrap wrist guard, such as are still used by traditional archers today, to protect the shooting arm from bow-string chafing. 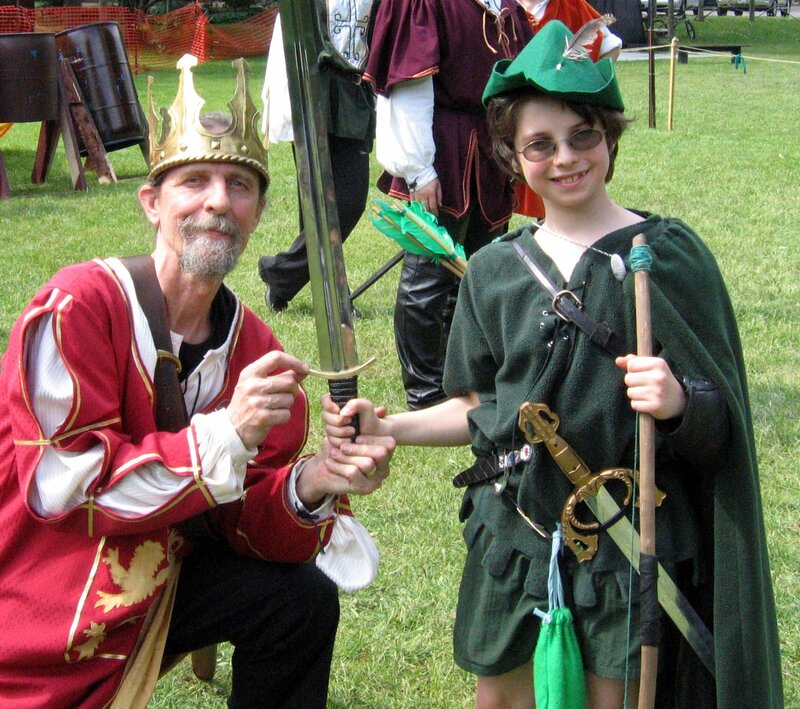 I made a quiver out of green fabric, and by slitting the wide ends of some skinny bamboo garden stakes, I was able to push in large green craft feathers to fletch the arrows. The pointier tip ends were pushed into corks for safety. (Before letting him loose on the world I asked him to shoot arrows a leaf bag target, and after seeing how gently they flew, I asked him to shoot some at me for photographs. Even the ones that hit didn’t really hurt. He wore this (without the fleece under layer) later to attend the Robin In The Hood Festival. By this point I had pretty much established that my son could be anyone he wanted to be for Hallowe’en so long as I there was enough advance notice given. 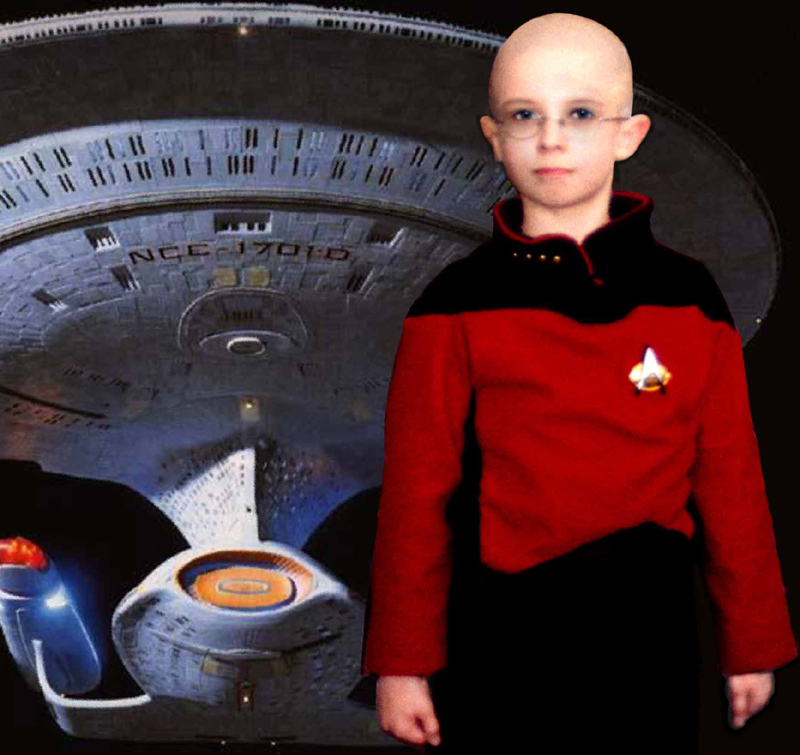 For this one, his dad sent away for a Star Trek Next Generation badge/communicator which provided a lovely touch of authenticity to what was essentially a simple costume..
For the tunic and pants I again used my favourite costume fabric, arctic fleece, which has a bit of stretch capability but is quite forgiving for those of us who really only take on one of these projects once a year. Unlike most of the other costumes I’ve made, this one had to be pretty form-fitting, so it wasn’t revisited in later years. It seems my son is as much a purist as I, as he insisted on having his head shaved for this one. The hairdresser was uncomfortable going all the way, so after a buzz cut the final close shave was undertaken by Dad. Even then, my son’s dark roots were clearly visible under the translucent skin of his perfectly smooth scalp, so a layer of flesh tone make up was required.